Posted: Friday, July 27, 2018. 1:05 pm CST. By BBN Staff: This morning the National AIDS Commission (NAC) distributed paints made during the National Testing Day event to partner organizations in the fight against HIV/AIDS. 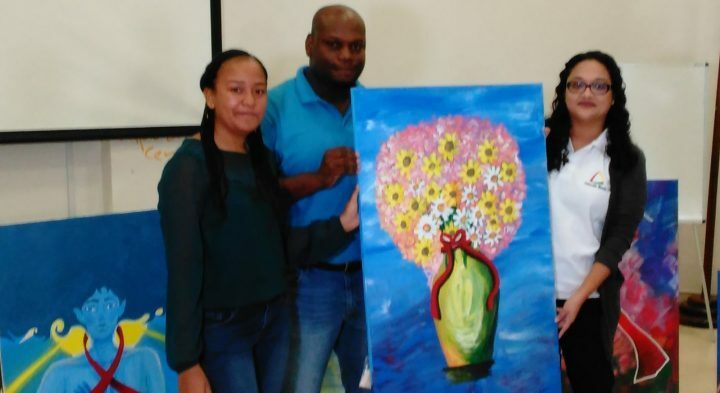 The NAC held a handing over ceremony at the Inspiration Center and gave paintings to the Belize Family Life Association (BFLA), Ministry of Health (MOH), Atlantic Bank, Belize Natural Energy (BNE), the Department of Youth Services (DYS) and the Love Foundation. The event also featured many of the artists on hand to explain the theme of their piece. Arthur Usher, programme officer for the NAC, explained that entities like BFLA, the DYS, and MOH, received paintings in honor of their years of working in the national HIV response, while organizations like BNE and Atlantic Bank were sponsors for the event. “With the transition from Regional Testing Day to National Testing Day, there was a gap in financing that these organizations stepped in to fill,” Usher said. The NAC held the first National Testing Day on June 29, setting up HIV testing sites in public spaces countrywide. The event saw more than 1,700 Belizeans coming out to learn their status and boasted the first event of its kind where more men got an HIV test than women. The artists gathered at the Battlefield Park in Belize City to paint the pieces live while the event was going on.